If breakfast really is the most important meal of the day, it’s a good thing we’ve got baked goods to start our mornings off right. I’ll take a homemade pastry over bacon and eggs any day. These muffins are so easy to make, and they’re really nice and moist, thanks to the buttermilk. I’m such a sucker for buttermilk in baked goods. 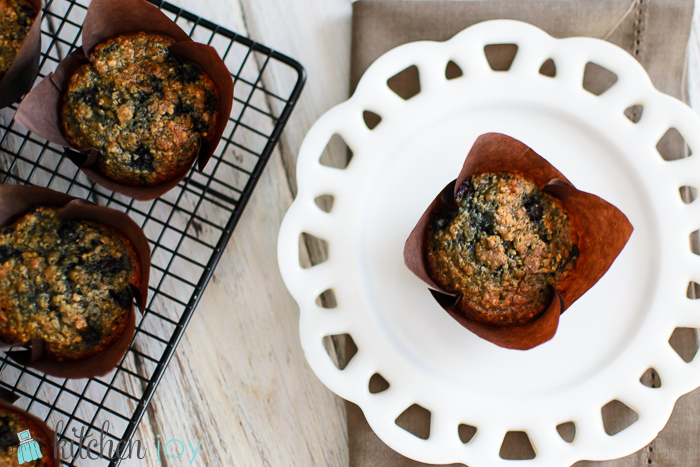 These Blueberry Oatmeal Muffins are the perfect thing to make on a Sunday afternoon to get ready for the week ahead. Plus, it’s a much healthier and tastier grab-and-go breakfast option than anything at a drive-thru on the way to work. Hubby LOVED these…and it’s a good thing, since I wrapped and froze 6 of them and am hiding them in his suitcase for his business trip to France this week. We shall see if they arrive intact. 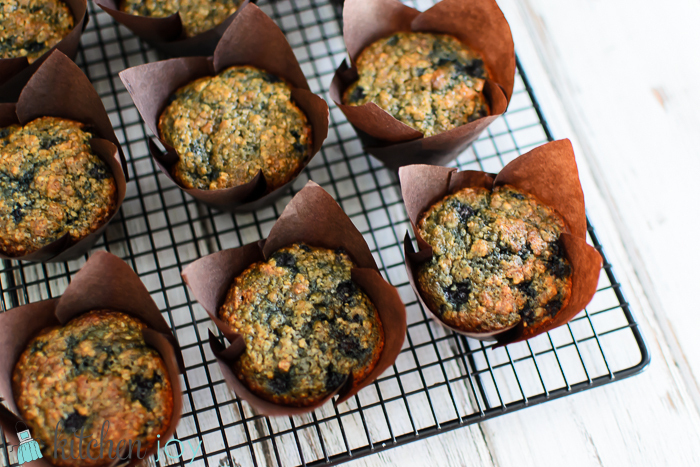 Blueberry muffins aren’t only for breakfast, though. 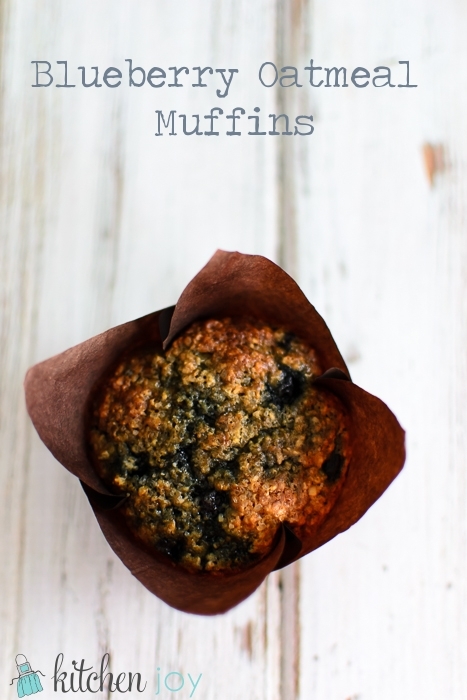 While I was growing up, my Mom would often make blueberry muffins to accompany our dinner. I loved it, and I do the same thing to this day. They’re an especially wonderful addition to a spicy meal, since they seem to calm the heat down better than drinking a glass of milk. Believe me, they saved me the other day after I ate some spicy pad thai and my face was sweating, my lips became chapped, and my mouth was an inferno. (I may or may not be a bit wimpy when it comes to spicy foods.) One of these muffins and I was good as new. Prepare muffin pans with paper liners, or spray with cooking spray. Pulse oats in a food processor until they coarsely ground. Place in a large bowl. Add flour, brown sugar, cinnamon, baking powder, baking soda, and salt to the oats and stir until thoroughly mixed. In a medium bowl, combine the buttermilk, oil, eggs,and vanilla. Add to the flour mixture and stir gently, just until moistened. Toss the frozen berries with the 2 tablespoons of flour. Gently fold the berries into the batter. Spoon batter into prepared muffin pans. Sprinkle coarse sugar over the top of each cup of batter. Bake at 400 degrees for 20 minutes, or until muffins spring back when pressed. Remove from pans immediately and place on a wire rack to cool.